The first question you may have is, "What is a core belief?" Well, a core belief is something you've grown up with. Something you believe defines you as a person or defines the world in which you live. Many times core beliefs aren't easy to identify. They hide in our subconscious minds and sabotage us when we try to make changes in our lives. Core beliefs are things you learned to believe as truth when you were a child. Core beliefs are set up by the age of six when a person's personality has formed. Therefore, it is hard to come to terms with them-even to figure out what they are- without doing a lot of introspective work. Many people dive into the topic of self healing with gusto. They read books, think a lot about what they've gone through and meditate. These are all great things to do when you're looking to make changes. But finding core beliefs is digging into your self talk at a fundamental survival level. It is stripping everything in your life, personality and belief system down to the core to find out what really makes you tick. The things you find at that deep personal level are your core beliefs. Let me explain. Recently, (a year and a half ago), my youngest child passed away. It was devastating. It threw me into a state of questioning about my very existence. It made me realize that everything I thought I knew was a facade-a man made explanation for how the world worked and what went on behind the scenes spiritually. It also caused me to come to terms with the fact that I had a lot of changing to do. I went on a quest of sorts to examine my life and my theories of living. That quest brought me back to my childhood-to the time when I was in the birth to six stage. Once I began meditating and looking deeply into what made me tick, I began to realize things about myself that I had never paid much attention to: the core beliefs that directed my behaviors and reactions. That was an eye opening journey! Never did I realize the impact my core beliefs had on my existence. It seems to be something we overlook because they are so deeply buried under everything we've been through. Prejudices we've inherited from our families, false beliefs we've clung to as truth because of what we've been told, observations we've made because of who we've been surrounded by when we were young-these are the core beliefs I'm talking about. 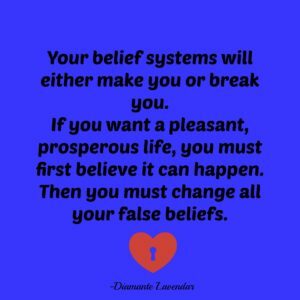 These beliefs have profound impacts on us because they are our built in survival instincts, whether true or false, surrounding how we live and what we do. And much of the time they're wrong. For instance, I was molested by extended family members from the ages of two to twelve. I thought I had dealt with the issue fully but I realized I had not. I still was internally waging war with a core belief that I was not safe. It is strange how we can gloss over such important issues as easily as wiping a dirty table. We figure as long as we can't see the dirt the problem is over. That couldn't be more untrue! If you're feeling dis-ease about anything in this life, it's time to do some deep, heavy introspection until you come to the belief system behind it. Because you will find a core belief to blame for every dis-ease you encounter. If you want to be a ninja in the game of life, it is up to you to find the underlying cause for every case of dis-ease you feel. And when you become your life ninja, you will find it. And it will free you! That is why it is so important to dig deep into your subconscious. Every lie you expose will bring you more glorious freedom! And isn't freedom and peace what you really crave deep down? Along with meaning and purpose? I think those are the most important attributes that every person strives for. If you identify every false core belief, you will find yourself building more and more prosperous attributes in every aspect of your life. So be a ninja and begin your journey today!